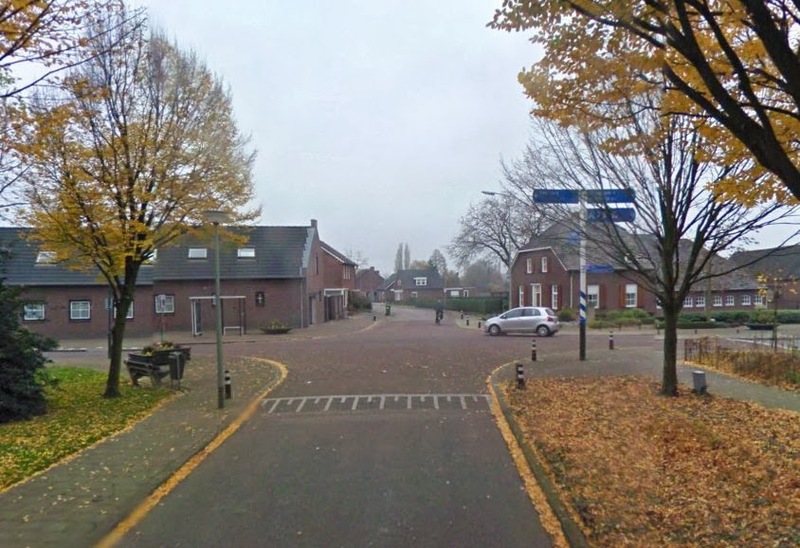 At nine in the morning on the 27th of November, a sixteen year old girl in the village of Oostrum (in the province of Limburg, in the south of the Netherlands) was seriously wounded when she was involved in a crash with a car. Sadly, this was not a unique event. While the Netherlands is the safest country in the world in which to be a cyclist, it is still the case that hundreds of people are injured and killed every year in this country. The Netherlands could still do better. manoeuvre across traffic is difficult and error prone. Why is this road dangerous ? There is a common thread running through many stories about traffic accidents in the Netherlands. Where injuries occur, it is often the case that they take place where the infrastructure is sub-standard. This location definitely has substandard infrastructure. It's easy to see where the opportunity for the crash came from. This road carries a lot of relatively high speed motorized through traffic as well as a lot of cyclists. Many of the cyclists are children going to school and they have to make a difficult to judge manoeuvre, crossing parallel traffic while checking both behind and in front, as part of their daily journey. Cycle-lanes are not really infrastructure at all, they're just paint. This road is decorated by particularly narrow on-road painted cycle-lanes and does not have the physical infrastructure which could protect cyclists from the danger of motor vehicles. and drivers to overtake. This is bad infrastructure. Wide cycle-lanes (wider than 2 m) can be useful in some locations as they can then help to encourage drivers to pass at a safe distance. However, even wide on-road cycle-lanes are not suitable for roads where there are many motor vehicles or where either the motor or cycle traffic doesn't fit in the allocated lane. Narrow cycle-lanes like the one involved in the incident in Oostrum don't work very well anywhere. These encourage cyclists to ride in the gutter and they encourage drivers to expect cyclists to be in the gutter. Cycle-lanes of this design encourage close passing and risk-taking by drivers. They're often associated with drivers overtaking cyclists and almost immediately turning across their path. All cycle-lanes, regardless of width, make it difficult for a cyclist to safely turn across other traffic. Junctions need more thought than is apparent on this road. that doesn't mean it is good and should be copied. The local councillor interviewed by the TV crew doesn't see the problem. He gave a response on camera in which he said that there were good sight lines and everyone should be able to see what everyone else is doing and behave accordingly. British readers may find parallels with Boris Johnson's widely criticised comment that cycling in London is "OK if you keep your wits about you". are no cycle-paths within Oostrum. What about training and "Strict liability" ? Unfortunately, the councillor has slipped into a common mode of thinking amongst people from all countries. It is imagined that given enough advice, people won't make mistakes. This is a fallacy. People will always make mistakes. This almost defines us as being human. Not only will no amount of training prevent either child cyclists or adult drivers from making mistakes, but law changes or punishment for mistakes will also not remove the possibility of mistakes occurring. 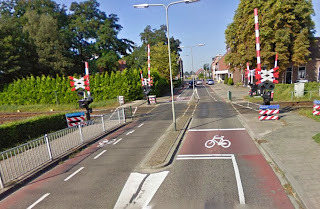 Readers from overseas who sometimes over-estimate the effects of "strict liability laws" in the Netherlands should note that this law doesn't prevent mistakes from being made in locations like this where the infrastructure is inadequate to the task of keeping people safe. The Dutch drive no more perfectly than do people of other nations, and while Dutch children receive limited traffic training in school, it's quite obvious from watching groups of children cycle that this doesn't have anything like the beneficial effect on behaviour that training advocates imagine. Just because someone is Dutch and lived through campaigning forty years ago about childhood freedom and safety, that does not mean they will automatically understand about these issues. Some people simply can't see things from the point of view of others. 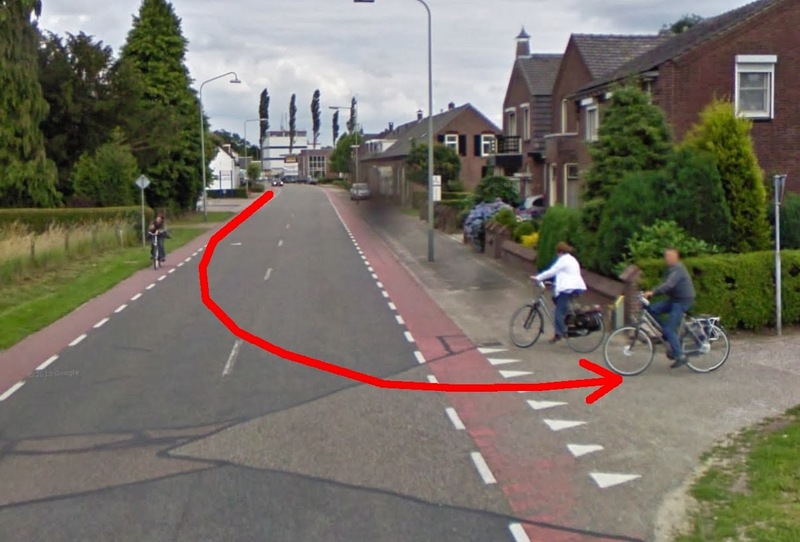 Cycling is almost too common in the Netherlands. People take it for granted and don't realise that the high cycling modal share of this country is due to infrastructure and not culture. What makes Dutch roads and cycle-paths safe is not training or strict liability but Sustainable Safety (Duurzaam Veilig). Sustainable Safety is a policy of reducing the opportunity for mistakes to become injuries by reducing the consequences of making such mistakes. Roads should be self-explanatory and forgiving (read an article which explains more). Stationsweg is the road to Venray's railway station, so has probably always been quite busy. However, it hasn't always been like this. At some point, probably in the 1980s, adding cycle-lanes to this road perhaps seemed to make sense. However, the world didn't stop then. Both Oostrum and Venray have experienced growth in the last thirty years. There are many new homes, many more people. Car ownership in the Netherlands has grown and the use of cars has also grown with it. Not all infrastructure in this country has been updated to current standards. Stationsweg in Oostrum is just one of many examples of roads which lag a long way behind the standards of 2013. The principles of Sustainable Safety have yet to make a dent here. There's some catching up to do. Residents of Oostrum are absolutely right to demand changes which will improve the safety of themselves and their children. The safety of the next generation is the best thing any of us we can possibly campaign for. Diverting motorized traffic using this road to other routes would remove much of the danger from cars, regardless of other measures. Lower speed limits would make it easier to judge the speeds of cars and reduce the severity of injury. A raised table and narrowing of the motor lane to a single vehicle width could reduce the speed of cars at the point of crossing. A 90 degree crossing would make it easier for cyclists to see cars coming from both directions. A central reservation for crossing would remove the need for cyclists to see in both directions at once. A parallel cycle-path along much of the road would provide more distance between motorized vehicles and cyclists. Have the Dutch forgotten what was achieved ? in the 1970s, the Stop de Kindermoord (Stop Child Murder) protests gained mass support. Other local actions such as dramatic protests in De Pijp in Amsterdam also played a part in changing the way people thought about safety on the streets. This country began to transform itself 40 years ago. and that happened because there was popular support for change. While not everyone was in agreement at all times, the entire population was behind the idea of children being safe and infrastructure across the country was transformed as a result. Unfortunately, keeping up momentum is not easy. Because such a long time has passed, people have forgotten how important this was. The safety of children is no longer an explosive campaigning issue. The situation in the Netherlands isn't bad overall. Dutch children are still rated by UNICEF as having the best well-being in the world, but this is a sign of past success and did not come about due to current policy. The adults who led the change in the 1970s and the experts who designed the improved infrastructure have largely retired. There are signs that their good ideas are to some extent being forgotten. The children of the early 1970s, for whom the actions were taken, are now middle aged and even their own children are grown up. Younger activists are largely unaware and unappreciative of what was achieved and how unique and significant this was. Even Dutch people often fall into the easy trap of believing that they cycle because it's in their culture. We've found that people are quite shocked if shown pictures of what their streets used to look like because they don't remember the problems that designing towns solely around motor vehicles used to cause. This is a dangerous time for the Netherlands because some of what made this country great is being forgotten. It should be no surprise that Dutch children are being taken to school by car more often these days. Why take a study tour ? When we first started visiting this country (in the last century), there was no-one to guide us and we formed impressions based solely on what we saw. Like other people who have done the same, we came to some incorrect conclusions. Compared with villages in other countries, it's possible to approach Oostrum on surprisingly good quality cycle-paths. The village largely has relatively low speed limits and contains both a raised table in the centre and on-road cycle-lanes leading to the west. Not all of this is bad, and of course it could appear to be an example of relatively good practice. It would be easy to overlook the problems cause by the use of on-road cycle lanes on a busy road, especially if these were not witnessed first hand because of the time of day when they were observed. We find it is not at all uncommon that people take photos of substandard infrastructure that they've found in the Netherlands and try to have similar ideas adopted after they return to their own country. Not only does older infrastructure not necessarily make itself obvious if you're from a country which is less advanced with regard to cycling but people also sometimes view what looks more familiar as more achievable, even though the cost difference is often not large, and doing something twice in order to fix a mistake is always more expensive than doing it properly in the first place. the services of any other company. We initially started running study tours because no-one else at all was offering this service. There is much that other nations need to learn from the Netherlands but this knowledge was either not being transferred or it was being misunderstood (e.g. enthusiasm about what the Dutch got wrong. e.g. Shared Space). As a result of our relatively early start, having moved here, learnt Dutch and as a result of having shown hundreds of people both what is good about cycling in the Netherlands and the pitfalls that must be avoided, we now have more experience than anyone else. Being completely independent of any other company we have no reason to push ideas in order to sell them. We simply show you what works and what does not. If Oostrum were local to us, we might visit to point out problems to be avoided. However there's no need to make a special trip. There are bad examples of infrastructure closer to home which already feature on our study tours, where we explain the problems caused. We also, of course, feature examples of very good infrastructure and encourage people to learn from these about what really works to encourage cycling. Our tours allow you to save yourself from misunderstandings and wasted effort. The Netherlands has the difficult job of being in front and not having any other country to copy from. In other countries the job is much easier and there's no time to waste. You're already decades behind what the Dutch have achieved and the Netherlands still stands as very easily the best example to try to emulate. Note that in most cases, Dutch children make relatively uneventful journeys to school. 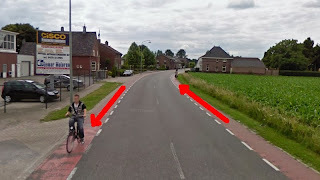 This is what makes cycling to school so popular in the Netherlands. However we have to be wary because there has been a small decline in recent years. The alderman points out that the records don't show it to be a dangerous junction. However, as of a few years ago, the police no longer record accidents in which no-one is injured (as a cost-saving measure, obviously). I used to live near a junction where at least every other week an accident would occur, but the police and municipality ensured me that the junction wasn't dangerous according to their figures. That just means that a junction isn't dangerous until someone gets killed on it, I guess. 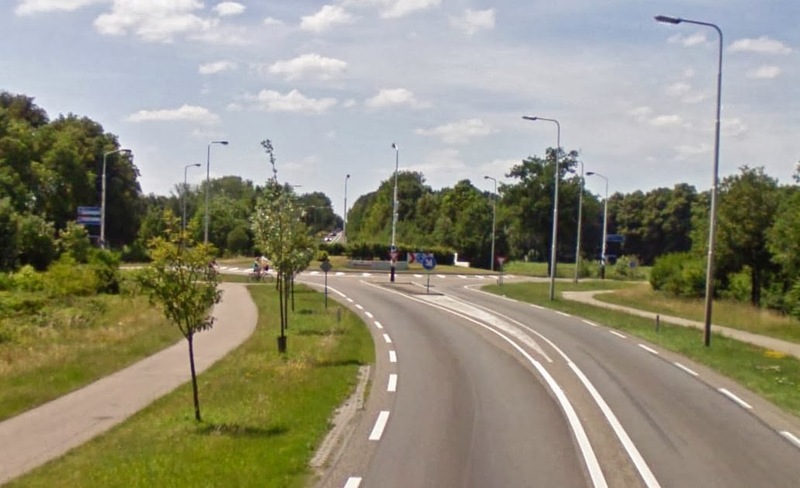 Also, technically, the lanes in the picture aren't cycle lanes (fietsstroken). They're road narrowing markings, meant to reduce speeds by visually reducing the width of the central black tarmac area, thereby reducing motorists' speeds. 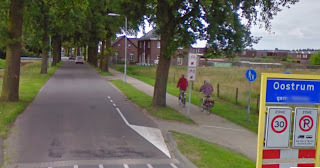 The area outside the lines serves as a 'cycle suggestion lane' (fietssugestiestrook), but it does not have a legal meaning, and cars can park in them. bz2: Thanks for your comment. The point about not recording collisions until there's been an injury is well taken. As well as a money saving measure, this is of course a very fine way for local authorities to avoid responsibility for having to do anything. As for the cycle lanes. I should have made this clearer. In the UK, we have two types of cycle lanes - mandatory lanes with a solid line in which cars may not be driven and advisory lanes with a dashed line in which cars may be driven. In British terminology, a fietsugestiestrook is an advisory cycle lane - i.e. still called cycle lane, hence the confusion. Whether a solid painted line actually prevents motor vehicles from crossing into a cycle lane any more effectively than a dashed line is of course another question. I don't think people in the UK know what a mandatory cycle lane is. Many tend to be within bus lanes which keeps cars away. However the vast majority of people keep out of all cycle lanes but a significant minority either drive right up to the line or will swerve into them. I often get punishment passes on a stretch of road that has a shared cycle/pedestrian path which is through an area that is, shall we say, less enlightened than it could be. For that reason I don't use it as I've been threatened while using it. The sort of set-up in the video is still being promoted for dangerous sections of road in London, of course when it comes to any junctions there are not even any markings. The very place where they are actually needed, they vanish. Your point about education is a good one. Even if you could eradicate mistakes you can only educate those that want to learn but there is a significant number of people in the UK that just are not interested in how cycling can contribute to society, its benefits to cyclists and drivers. The reduced record-keeping mentioned above is also somewhat contrary to trends in tracking failures that we actually care about. The New York Police Department harasses thousands of young blacks with "stop and frisk" for the claimed purpose of reducing crime (it's not clear it has helped, US crime is down everywhere, this may have merely been a costly and counterproductive racist ritual) -- but they've not taken similar steps to deal with pedestrian and cyclist deaths from car crashes, even though that number is larger than the murder rate. In the computer world, cheaper microcontrollers, storage and network has led to more and more data collection for the purpose of early failure detection and gathering enough statistics to allow earlier failure prediction. And of course, there's the NSA. The pattern I observe is that if you care about the failure, then you spend the money on necessary data collection; and if it happens that data can be collected inexpensively, then you collect quite a lot of it. That is why the offstreet bike lane mentality is not the only answer. Bikes and cars have to interact on common streets and need to be legally allowed to i a safe way. If the cyclists would be IN THE LANE, controlling use of the lane, after safely entering when they can of course, and allowed to make the left turn when safe (as anyone in a car would do) then this would be much safer. Instead, the "bike lane" and "bike trail" mentality of bikes and cars are safer when separated trains cyclists and motorists to not know how to safely interact in places where they are not separate. That scene where the girl hits the car and swerves in front of the other car ... scares the crap out of me! GF: To say you've missed the point would be to give too much credit to you. Insisting on "cycling in the lane" (I'll avoid your all caps style) would simply reduce cycling to a minority activity, as indeed it is in all English speaking countries where this is the norm. These countries are also those where cyclists are least safe. NL is not perfect (that's a tag attached to this post amongst others) and pointing out this fact is the point of this blog post. However, the last thing that this country needs is to copy from places like the USA where not only is there the problem of almost no journeys being made by bicycle but also the cyclist injury rate is 30 times as high and the death rate 5 times as high per km travelled as the case in this country. The Netherlands is still the very best example for any other country to look to in order to find best practice. The best of Dutch infrastructure results in cyclists having faster, safer journeys than in any other country. Segregation of modes is absolutely key to this. Paul, it's a small part of the Netherlands where the infrastructure has yet to be modernized. In a land of very good bicycle infrastructure, it is the exception rather than the rule. The point of the post is "imitate the Netherlands, but be sure to distinguish mistakes from best practices. " It's also reassuring to know that the Dutch are also mortal.